Call me boring, but I like to keep my eyeliner pretty simple and basic. The most I'll do is attempt a cat-eye once in awhile and I'm thinking I'm being "adventurous". I just feel that most make-up trends I think are reserved for teenagers or people who aren't afraid to take a few beauty risks - (which I'm not). But after viewing this quick tutorial from Refinery29 I'm starting to reconsider this whole colored eyeliner thing. 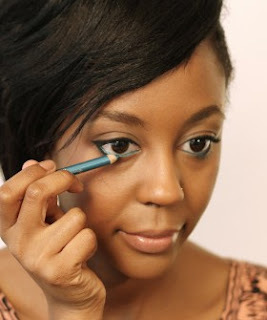 Make-up artist Raychel Wade show us two fun ways to dress up your eyes with colored liner and I'm seriously considering on trying the first one.